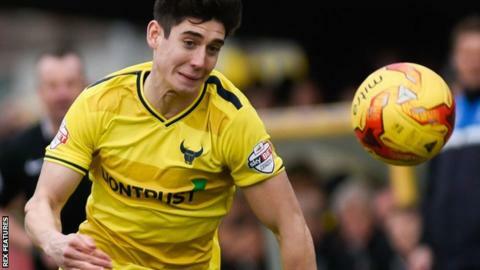 Oxford United midfielder Callum O'Dowda admits he is frustrated to be temporarily leaving their League Two promotion push for international duty. The 20-year-old will link up with the Republic of Ireland Under-21 squad for qualifiers against Italy and Slovenia. It comes after an eye-catching brace for the U's against Barnet on Saturday. "It's the third time I've gone away after scoring," he told BBC Radio Oxford. "But I'll be fully buzzing when I come back for the run-in." Oxford-born O'Dowda was named runner-up for the Republic Under-21 player of the year award on Sunday behind Preston midfielder Alan Browne. And he believes international experience has aided his development as a player. "I spoke to the manager (Michael Appleton) when I last went and he said it's only going to benefit my game," O'Dowda said. "Being with a different manager and a different team broadens your experience. "There's a lot more one-touch passing involved in international football and there's a real structure of play in terms approaching the game."